Drought is a vice to world crop production, exponentially enhanced by global climate change. Rice, a basic food crop for a major chunk of world populace, is largely affected by environmental challenges such as drought, salinity and heavy metal. This study brings to limelight differential drought tolerance capacity of rice varieties indigenous to North East India, a hot bed of indica rice diversity. Initial screening of rice varieties were performed through physiological dose-dependent studies under PEG (0%, 10%, and 20% which is equal to osmotic potential values of 0.001, 0.54 and 1.09 MPa, respectively), induced drought stress for three time intervals of 1, 3 and 5 days. Hierarchical clustering of the parameters on which the cultivars were analysed revealed Tampha and KMJ 1-12-3 to be relatively more tolerant whereas Chandan and Ketaki Joha as the sensitive ones. Biochemical studies for hydrogen peroxide (H2O2), proline, lipid peroxidation (MDA), lipoxygenase (LOX), superoxide dismutase (SOD), catalase (CAT), guaiacol peroxidase (POX), dehydroascorbate reductase (DHAR), monodehydroascorbate reductase (MDHAR) and glutathione reductase (GR) were then performed on two cultivars (Tampha and Chandan) to elucidate the differential tolerance to drought, focusing on anti-oxidative response mechanism. The biochemical fingerprint showed significantly lower accumulation of H2O2 and MDA; higher accumulation of proline; and higher activity of SOD, CAT, DHAR, MDHAR and GR in the tolerant variety Tampha when compared to Chandan. 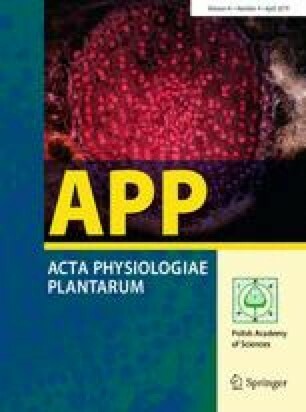 In addition, alteration of chlorophyll fluorescence due to stress was also monitored to ascertain the variation in photosynthetic efficiency between the tolerant and sensitive cultivars. Tampha showed better photosynthetic activity in comparison to Chandan as quantified by measuring chlorophyll fluorescence. This manuscript thus throws new light into the drought stress response of the varieties from North East India with global implications. The online version of this article ( https://doi.org/10.1007/s11738-019-2841-x) contains supplementary material, which is available to authorized users. We highly acknowledge Regional Agricultural Research Station (RARS), Akbarpur (Karimganj), Assam, India; Regional Rainfed Lowland Rice Research Station (RRLRRS) Gerua, Assam, India; and Central Agriculture University (CAU), Imphal, Manipur, India for supplying us with valuable rice seeds.